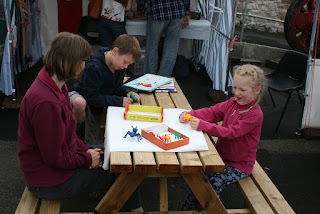 Just a quick word of thanks to each and every one of you who helped with what has turned out to be one of our most commercially successful Bank Holiday weekends to date, whether that be by helping to run it or by loaning items. Special mention goes to Team Cooke for all of their hard work and also the crew of the excellent Murder Mystery Evening who worked very hard! 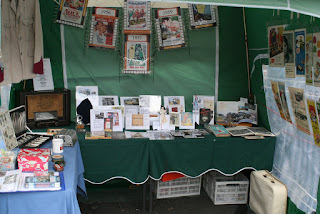 A couple of photos reflecting the hard work put in by June Cook, ably assisted by Barry, into the 50s display and introduction of todays children to one of the games of the time. 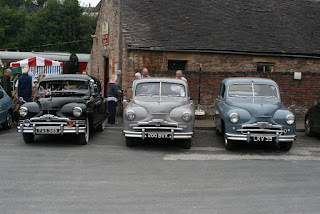 A couple of photos from yesterday's excellent 50s weekend. 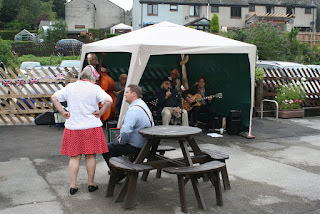 A video of the splendid Jazz Band for you whose name seemed to vary with "Off the tracks" being one that featured Sunday! Largely fine and quite warm for the second day of our 1950s Bank Holiday Weekend. The trains were quite well loaded and it was all rather pleasant in the event space on Platform 1. Down the yard, the new steel end for Faraday was welded in to place and primed (Pictured) Barry's south end had the cant rail cleaned up and primed and then a start was made on removing all of the old paint off the fibreglass dome ready for a fresh gel coat. 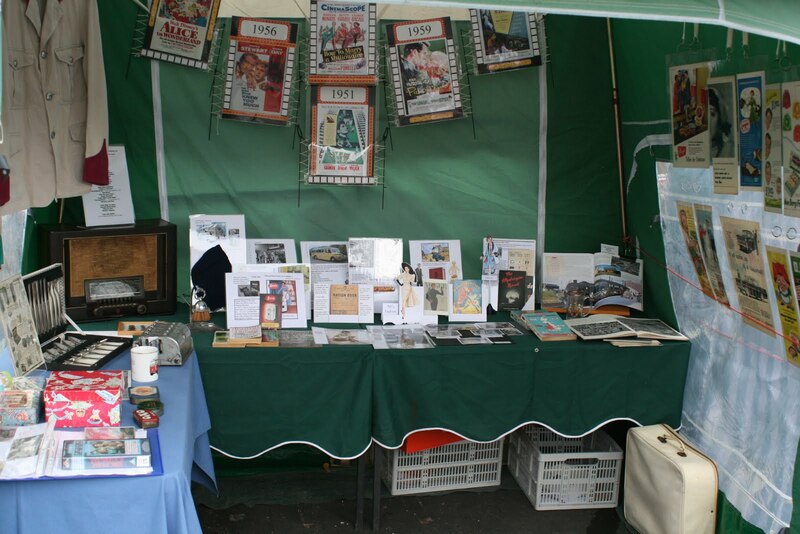 The usual English Bank Holiday wet weather failed to dampen the 1950's enthusiasm of our volunteers and visitors as we commenced day one of our 1950's weekend. After a slow, wet start the 11.12 Duffield service arrived at Wirksworth with a fairly full train of passengers in period dress. On the incline Henry Ellison undertook the scheduled steam service. Congratulations to Howard Lucas who passed his DMU guard assessment today. 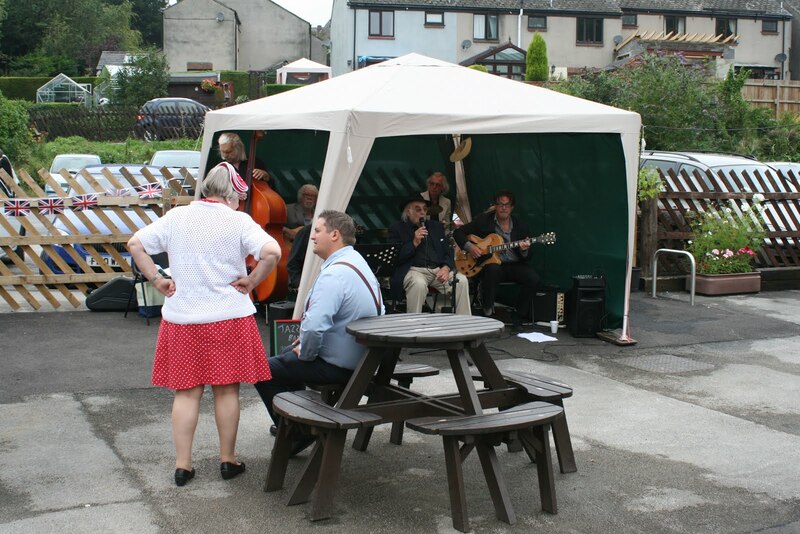 The courtyard at Wirksworth station was well patronised with a traditional jazz band providing an enjoyable musical interlude between train services. Down the yard the M.D. and a team of quick Fix Fitters set about a lengthy shunt to ensure both rolling stock and traction will be in the correct place for next week. Restoration teams from the LMSCA, DMU Group and the 'Duke' were in attendance and Richard provided a number of yard tours. Our friends up at the Steeple Grange Light Railway held a VIP Gala and our catering team was kept busy providing food and refreshments for both today's events. Over on platform three we held another 'live' Facebook broadcast with Bob Gibbens in a starring role which has now been posted to our Facebook site and available to view. Today's train services were supported by the Model Railway and EVRA shop. It is hoped the miniature railway will be in operation for the remaining bank holiday. This evening, back by popular demand, our Murder Mystery Fish & Chip Special left platform two for what promises to be an enjoyable evening of conundrum and intrigue. 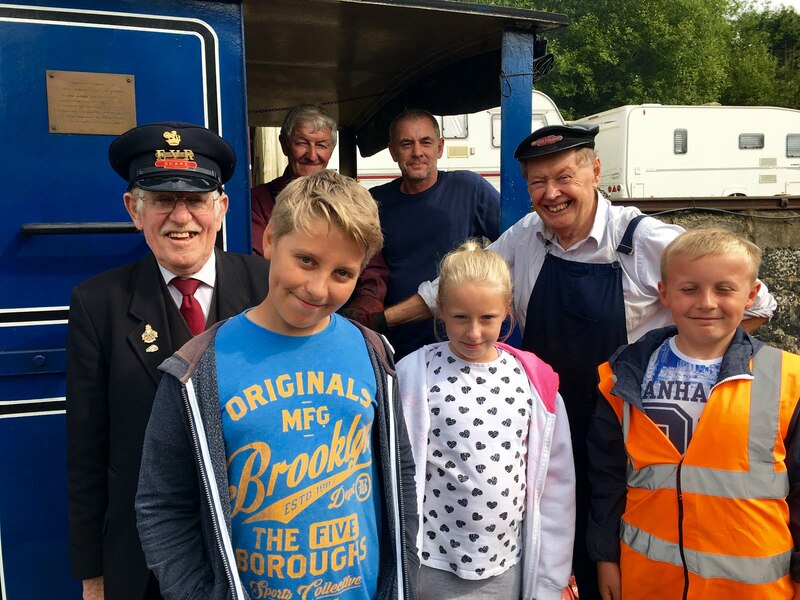 Today's photo captures the steam crew providing insight into the workings of a steam engine to a happy group of young visitors. Here's to better weather tomorrow! Another lovely sunny day in the Gem of the Peak. Lots of activity in the platform 1 picnic area/event space today as the remainder of the event for this weekend was set up. It's like gazebo city round there at the moment. Also the space was used this afternoon for a Santa meeting. Yes, the big man in red is making presents already even though you're still on your summer holiday! Derek and Dan managed to get two veneer panels reinstalled in to the BSK which is good and the Apprentice went round and filled up all of the coolant and oil reserves for the DMUs. The Sussex Fitter (Caravan Division) sorted out a buzzer fault on the 119 and also repaired the wiper on the 108. There'll be no Narrow Gauge this weekend as Lesley the Lister has been hired out by the Steeple Grange Railway for an event! The last running day before the 1950s Bank Holiday Weekend saw wet and dull conditions, yet it was still strangely warm. Passenger numbers were broadly on a par with yesterday despite yesterday being the three train diagram and today being the four. 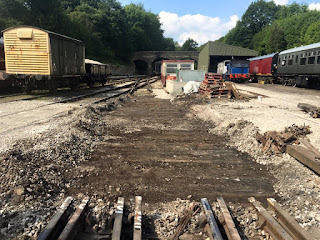 Down the yard, the PW gang firmly connected up and fettled the new plain line section where the northern half of the double slip stood last week. Next week will see the southern half of the double slip lifted and removed, which they hope won't be so complicated because it isn't encased in roadway. The DMU team replaced some missing alternator belts on 51188 and then turned their attention to shunter LJ Breeze which is having some maintenance now it is back at Wirksworth. It has been living down the line for several months. Iris continued to be fettled to connect up the stop solonoid to the new fuel pump fitted yesterday, all part of ensuring the vehicle is fit for service to star at the Dean Forest Railway's DMU Gala in a couple of weeks time. Work took place at the southern extremity too, with contractors starting work to insulate the roof area of the new Booking Office at Duffield. We have chosen to have the apex insulated to help keep heat down in the summer and keep it in during the winter. The insulation will then be over boarded with matching wood so it gives the appearance as though it is the outside roof and the rather nice apex feature remains in tact. Once this has been completed, it paves the way for the wiring for the lighting to be installed. Iris the rail car received a new fuel pump and we regrettably said goodbye to Joe Marsden who worked a day week on the DMU Maintenance team and covered the majority of the second man's duties on the Tuesday tea train. He starts a new job with Interfleet in September. Best wishes from all of us. The final operating day for visiting Class 20 D8098 saw average passenger numbers. Today brought to a close a total of 10 days for the 20, all passed with a faultless performance by this fine machine. Many thanks to the owning group for their role. The Buffet did particularly well again today too. Down the yard, Faraday had the corners bolted back on to the cab after the new steel had been put in previously. The PW Bubble had the large welded section filled and primed and some more metal was cut for the top of the cab on the corner. The Derby Lightweight power car had some more underframe components removed too. A damp and miserable day with heavy rain at times, which is quite a contrast to the nice weather we've enjoyed for a couple of weeks. This did lead to only a handful of volunteers being on site. We hosted a Drive a Diesel experience today utilising, first LJ Breeze to shunt out the DMU which went to Duffield in the morning and then the Class 33 this afternoon. Extra thanks to Eric and Helen in the buffet who had a few extra surprise guests for lunch at short notice. The Station Team did their usual weekly check round and installed a new length of work top in to the mess room. They needed a nice job inside! The apprentice finished his cleaning job on Iris and also moved some components to the stores. He then watered the coaching stock for tomorrow. Derek and Dan were also here trying to keep dry. A busy and warm day at Wirksworth with the visiting Class 20 still proving popular with our visitors. It is nice to see visitors sitting out in the new platform picnic area enjoying a bite to eat and taking in the atmosphere. The PW team are working here at the moment, wrestling with the removal of the more than life-expired double slip. They really have struggled and it has taken three days just to dig it out of the road way, free off the bolts and then lift it out of the way. The plan is to put a standard turnout in to what will eventually become the steam shed but this will be slightly further along from the area pictured (behind the camera), with plain line going in here. At least work can begin next week on putting in the new track. Also of a lifting theme, a crane was contracted in to lift the No.2 end of 55006 so that the vacuum cylinder could be replaced. A refurbished one was to hand which enabled the up, out, in and down maneuver to be done in just 1 hour and 20 minutes! All of the brake rigging was connected back up this afternoon and a test run up and down the car park siding proved satisfactory, although a better test will be done before the vehicle goes back in to traffic. The main task of the day was the PWay team starting to remove the Slip on road 2. Fishplate bolts needed to be cut off after being covered in ballast for many years. An unexpected gathering of heavy haulage from our neighbour at Wirksworth, Richard Lester, occurred yesterday. There was a photo and video session to illustrate the oldest vehicle in the fleet and their newest acquisition with some rail vehicles as background. 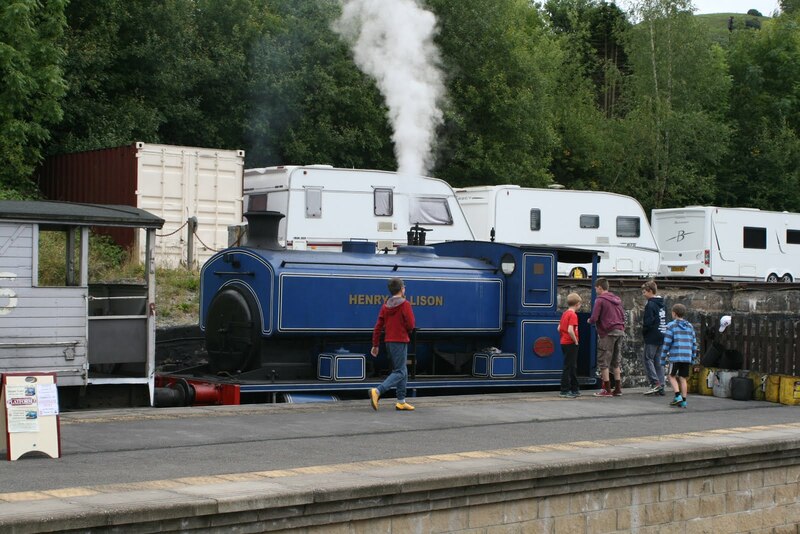 The photo shows the line up together with one showing the lure of steam for the younger visitors. A technical issue with Henry Ellison first thing this morning meant our footplate experience customer having to reschedule his session but thanks go to Mick Clarke and the team for their help in ensuring the engine was able to undertake its rostered service on the incline later in the day . 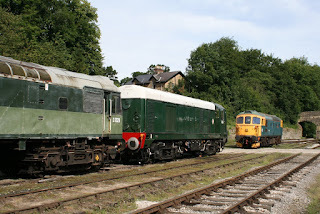 The Duffield service was hauled by the visiting class 20 and enjoyed good passenger numbers throughout the day. Down the yard the Wyvernrail Board held its monthly meeting. Unusually, the maintenance facility was relatively quiet probably due to a number of the DMU team playing with little trains at a nearby model railway exhibition. Following their rescue mission, the Duke's restoration team were gainfully employed with piston rings. Richard's yard tours were very popular today and it was again pleasing to see volunteers from our neighbouring heritage railways enjoying the delightful vistas of a sunny Ecclesbourne valley. Todays service was supported by the EVRA Shop and Pullman Buffet. Fairly sedate today as Friday is one of the rare days in the summer when we don't run trains. The Mark 1 coaches had their windows cleaned on the exterior for the weekend and the bins were emptied etc. We welcomed two MTT customers on site today so the platforms have been surveyed and some rails have been ground. A delivery of materials for the second platform at Shottle were taken into stock ready for work to begin in due course. A dull day where passenger numbers broadly equalled those of yesterday. The PW team were up at Wirksworth today for early Christmas presents, plenty of crossing timbers for reconfiguration work about to take place in Wirksworth Yard. 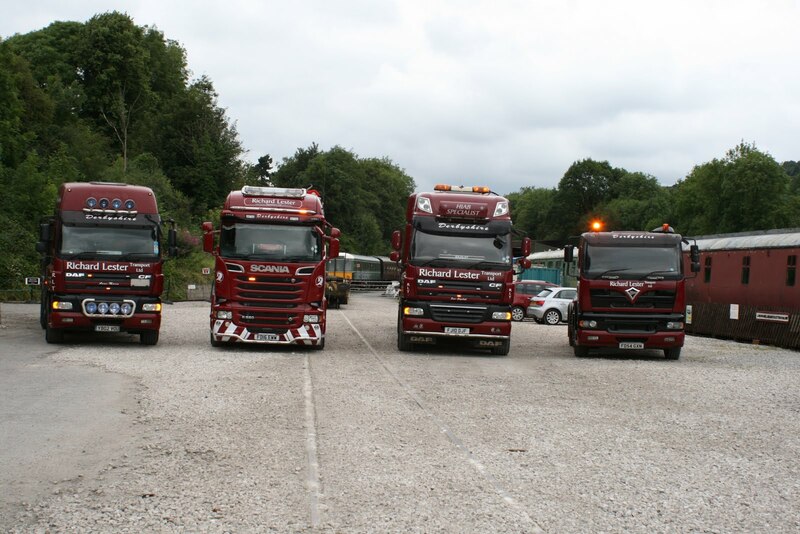 These all had to be unloaded from the delivery vehicle, sorted and placed on to waiting wagons. The Class 33 received some routine maintenance from Nemesis Rail to ensure continued performance on our Afternoon Tea trains for the rest of the season. Other than that, a fairly sedate day. The visiting Class 20 is back out at the weekend for those hoping to catch it. Today's service train to Duffield used Met Camms 50253 and 51505. The latter having received a new door and extensive C exam. I'd like to thank you, Richard Buckby and all your colleagues very much for their friendly, helpful and knowledgeable welcome to me and my team yesterday  do please pass on my gratitude to all we met. 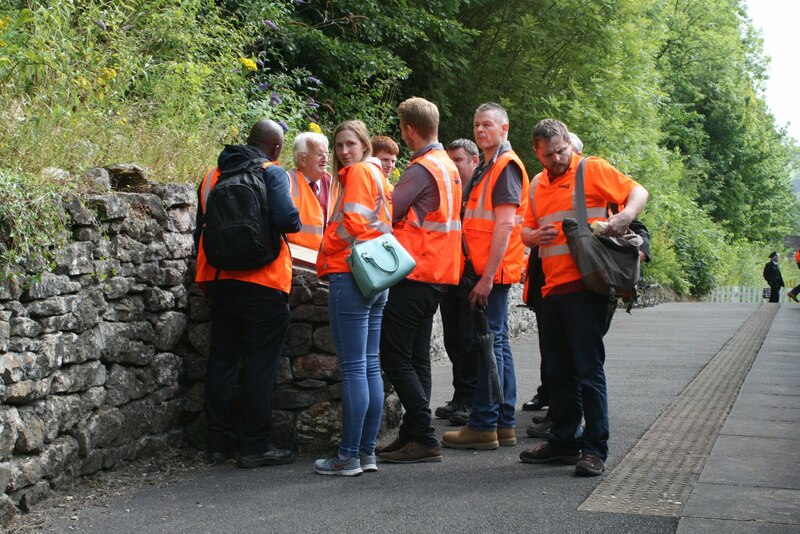 It was useful to understand the commercial services you are able to offer to the rail industry, to see the restoration work you are engaged in, and to understand some of the operational and commercial issues involved in running the railway. It was also a good opportunity to help me and my colleagues get to know each other a bit better as a team. Thank you too for the travel opportunities afforded, including the Ravenstor incline visit, and also for the opportunity to see the DJW 3 footbridge we will be working on later this year. Please continue to liaise with my colleague James Spencer on the timing and access issues associated with this project, which we look forward to delivering with Amco. In conclusion, we had an enjoyable and worthwhile afternoon, so please accept my sincerest thanks. The DMU duo removed a defective fuel pump from IRIS. We were pleased to welcome a group from Network Rail, Derby who are all involved with structures between Chesterfield and St Pancras including, for not much longer, our own. They were most ably hosted by Richard Buckby and he is seen talking about the history of the Ravenstor line. 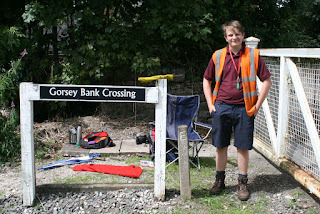 With only Guy Martin's autobiography for company Oscar performed the lonely but one of the many key tasks that made the diesel gala such a success by speeding the trains through Gorsey Bank. Yet another fantastic day as the second day of our Diesel Weekend. Not quite as busy as yesterday but that is expected for the Sunday of a gala. However, it was still really excellent making the whole weekend the best weekend by far. Its no coincidence that today was an 'Olympic Day' for our railway with records broken and a number of firsts to celebrate! Today was our busiest day ever since EVR records began with a record number of visitors to our railway. On Ravenstor over 350 passengers travelled up the incline today. 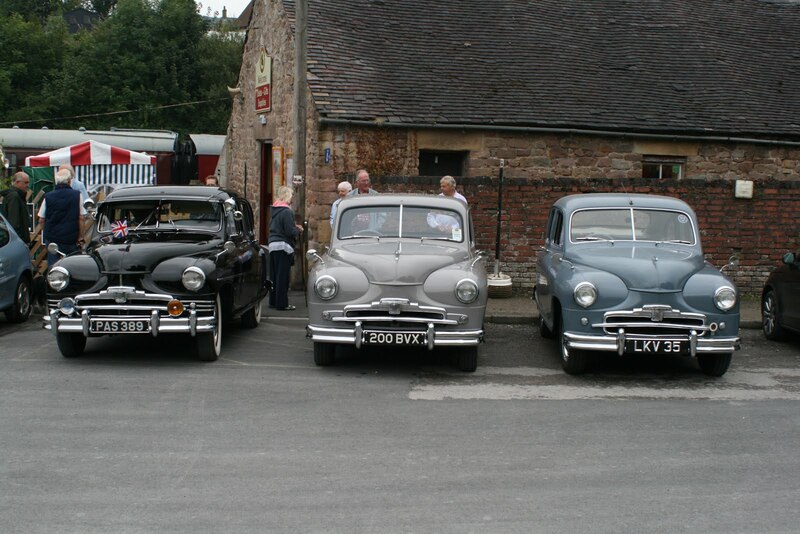 Our Wirksworth Duffield service had passenger numbers in three figures for all seven return trips. 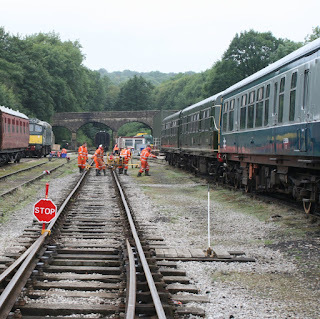 Our three main line diesel locomotives performed faultlessly and all services ran to time which is a testament to the behind the scenes forward planning that is the backbone of such a successful day. On the Ravenstor line we ran our first ever double headed loco propelled service much to the delight of the visiting enthusiasts. Idridgehay for the first time had over fifty passengers boarding a Wirksworth bound train as our visitors took advantage of the intensive timetable to break their journey for more photo opportunities. 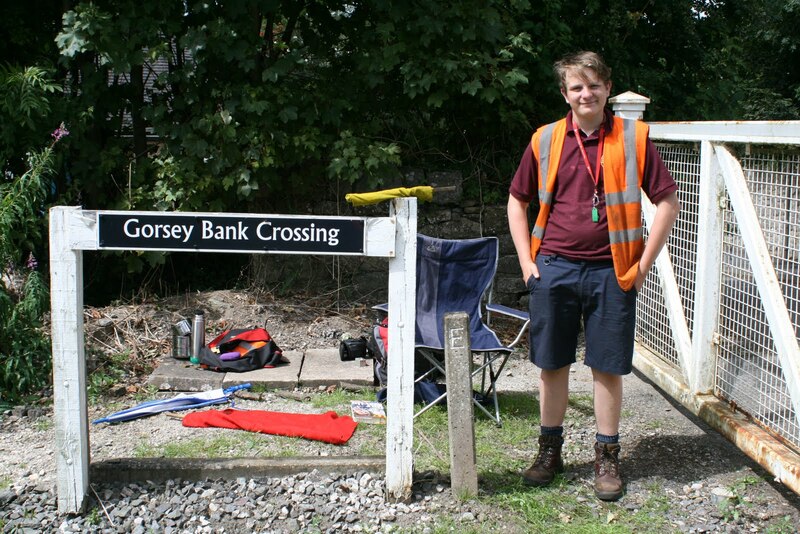 Such timings would not have been possible without the support of Hilton and Tony at Shottle and John Rhead at Gorsey Bank helping to ensure our train crews could keep to time. Today was the first time the Second Open entered public service and the on train catering it provided proved very popular. Another first was the broadcast of live video streams of todays engine and train movements on both Facebook and Periscope which were viewed by many people. We hope to develop this feature for future events helping us to reach out to new followers of our railway. It was also a pleasure to welcome a number of volunteers from our neighbouring heritage railways who came along to enjoy the day with us. Todays service was supported by the Model Railway and EVRA shop together with the Pullman Buffet which became an oasis for our hordes of thirsty visitors. To end a very successful day our fully booked Evening Curry Special train to Duffield will feature all three main line locomotives. Grateful thanks to everyone who helped make today such a success and we can only hope for more of the same tomorrow. The attached photos are of the popular Bar in the SO, Wirksworth platforms bursting at the seams and a link to a recording of our first live broadcast of the Class 20 pulling the 10:05 Wirksworth to Duffield service. No fewer than four different MyTestTrack customers on site today so we've had the platforms measured, accidents mocked up, rails ground and not to mention the tram too. Quite a good day to do it to when the railway would otherwise be doing nothing. Down the yard, the refurbished vacuum cylinder was hung back on Iris along with all of the associated brake rigging. It was then run up and tested successfully! Work continued on the PW Bubble with a really rotten patch of steel in the roof at the front on No.2 side being cut away and new being welded in place. Speaking of welding, Faraday had the old bent bottom portion of the cab cut away and the new steel which was delivered the other day welded in. A process which involved cleaning up the underlying structure before hand. Final preparations were made for the weekend including toilet cleaning, a three ton (exaggeration perhaps) delivery of Oxford Diecast models and bin emptying. The Information Room had the loose paint scraped off it and the bare underneath primed. The "big three" basking in the warm sunshire before their exertions this weekend. Sunshine and heavy showers saw it be the quietest day of the week on the trains, which actually follows the same pattern as last week. This is unusual because last season it was Wednesday which was the quieter. What's changed? The timetable is three trains on a Wednesday, could it be that? It is very much what we hope will be the calm before the storm though as it is our Diesel Gala this weekend. The lads were down the yard setting everything up which involved making up a 3 car DMU that can be hauled as a second set of coaches, cleaned out and also made sure the maroon rake was marshaled correctly and watered. The car for the incline was positioned. Amongst all of this, the shed was shunted to allow for more space for the PW 'bubble' as Iris needs to be quite far up the pit whilst it's faulty vacuum cylinder is overhauled and fitted. This enabled Faraday to go into the shed so that work can begin on welding new steel, specially cut by Twiggs in Matlock, into the cab end to replace that which is crash damaged (damaged long before it arrived here I might add). Other things for the weekend were prepared too, including printing timetables and posters etc. The Curry meal is now fully booked on this Saturdays evening charter and the Murder Mystery is filling up fast. All good signs. This report is late due to myself and Ben completing the trimming of the overhanging branches between Hazelwood and Duffield. The run round at Duffield was the worst area but a visit to the local fish and chip shop made it worthwhile. Even MD's work 12 hour days !! Todays tea train had the most passengers ever including a large hen party as per Martins photo. 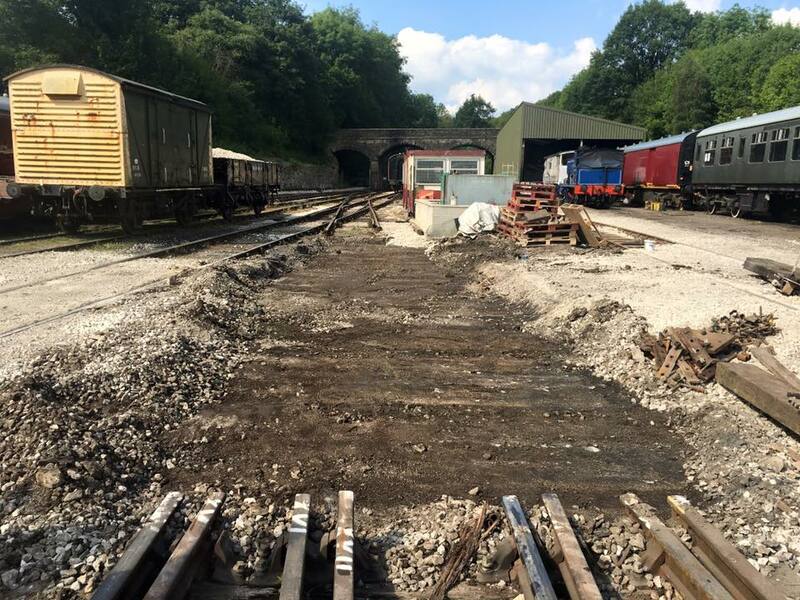 The Pway team replaced the last sleepers at Barnsley Lane which means since the programme to upgrade the track commenced they have replaced 580 sleepers. Well done !! Barclay N0 3 was cleaned and Cathryn's rebuilding continued. The cooler weather allowed more paint to be applied to the LMS brake van. Another 1st for our railway today as our Afternoon Tea Train played host to a 'hen party'. I must admit they were the best behaved hen party I have encountered and it was a pleasure to see the group enjoying our facilities. Special mention to the footplate crew who invited the bride to be onto the footplate in suitable attire. Needless to say they were most complimentary about the afternoon tea and the service they received. A training company uses our facilities to teach the mysteries of rail grinding to their students.